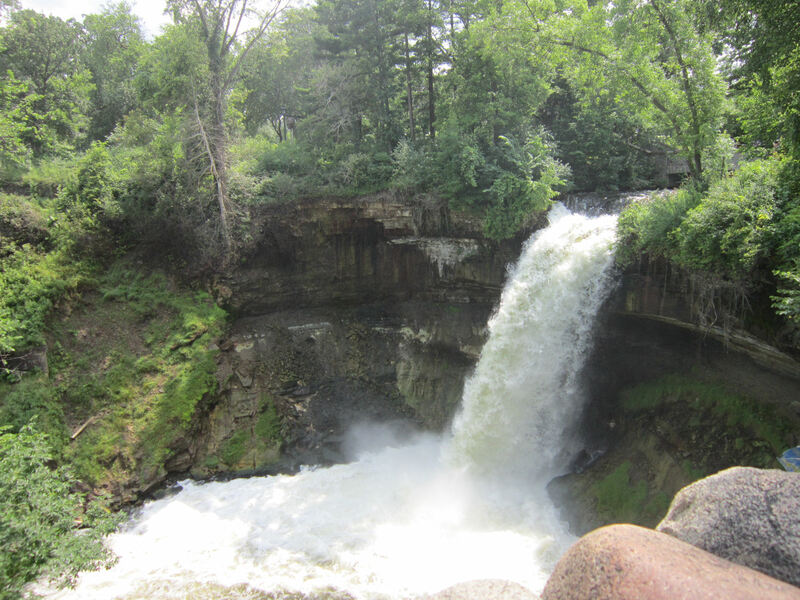 2014 Road Trip Photos #27: The Lovely Minnehaha Shuddered « Midlife Crisis Crossover! A few hours’ drive southeast from Fargo/Moorhead brought us right back to the Twin Cities, where we did lunch and had two more sights to see before exiting Minnesota for the year. Through no conscious intent, many of our to-do list stops for our seven-day vacation comprised man-made structures, companies, businesses, and other unnatural things — memorials, sculptures, State Capitol domes, foodstuffs, and so on. Nature was present in the background, but in a state containing a reputed 10,000+ lakes, we weren’t veering out of our way for specific natural wonders nearly often enough by the average traveler’s standards. 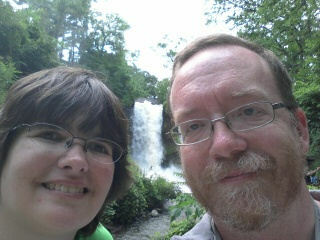 That brings us to Day Six and Minnehaha Falls. 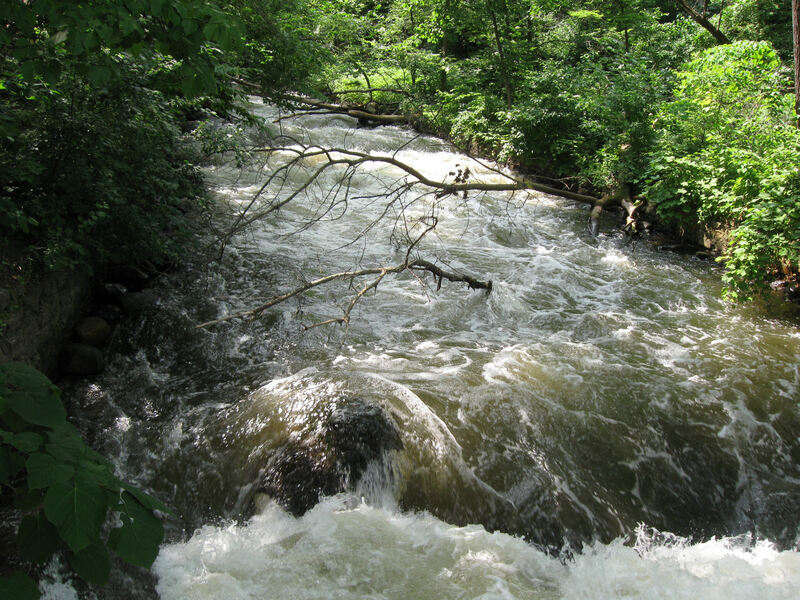 Minnetonka Creek runs twenty-two miles and connects Lake Minnetonka to the Mississippi River. Most of its path looks harmless, except for the one jarring 53-foot drop. 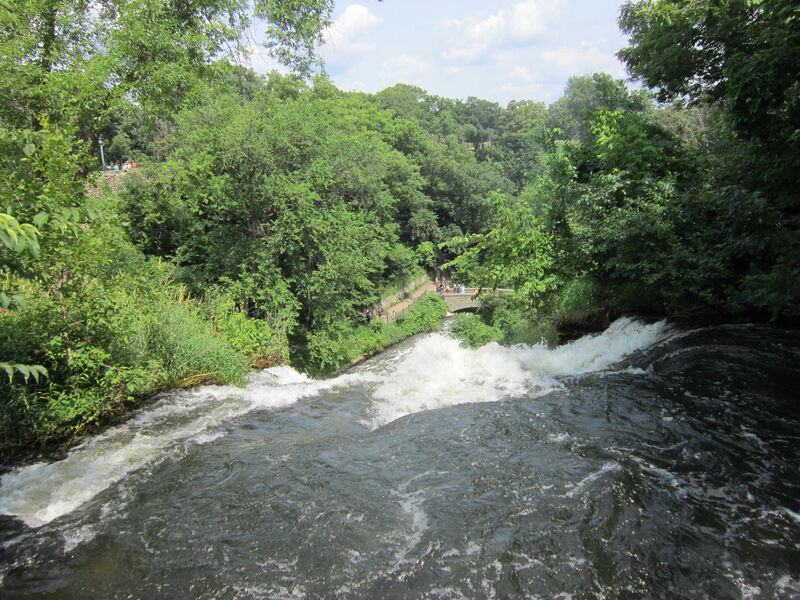 A white guy referred to it as Brown’s Falls in the 1820s, but he was overruled. 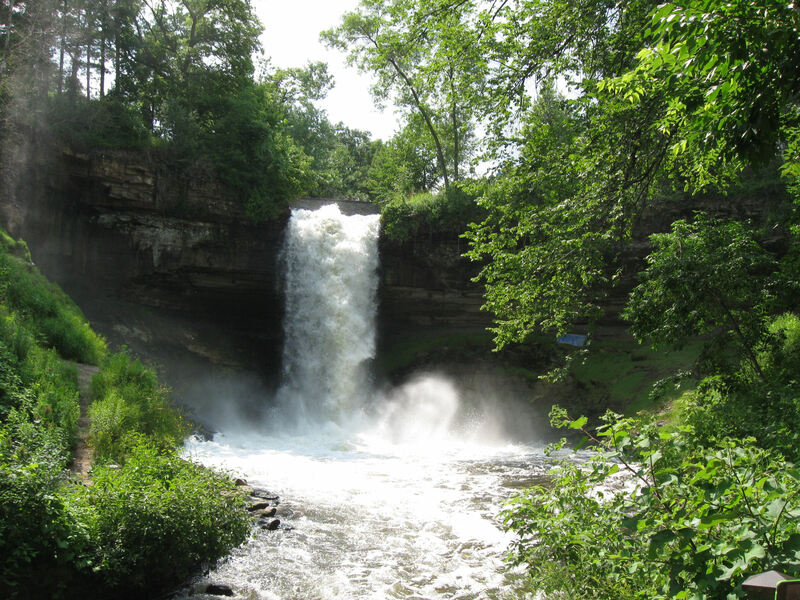 When you’re up close to it, either to the side or from above, “Minnehaha” is neither mini nor funny (Discuss! ), until you translate it into English literally as “Waterfall Falls”. Then you get the feeling it’s the sort of location Rocky and Bullwinkle might visit, except their version wouldn’t be this billowy and inviting. Minneapolis acquired the land and built a city park around it in the 1880s. 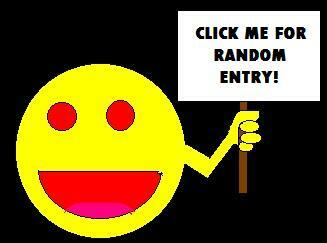 It’s surrounded by inexpensive paid parking, randomly located around the perimeter in odd shapes and short supply. 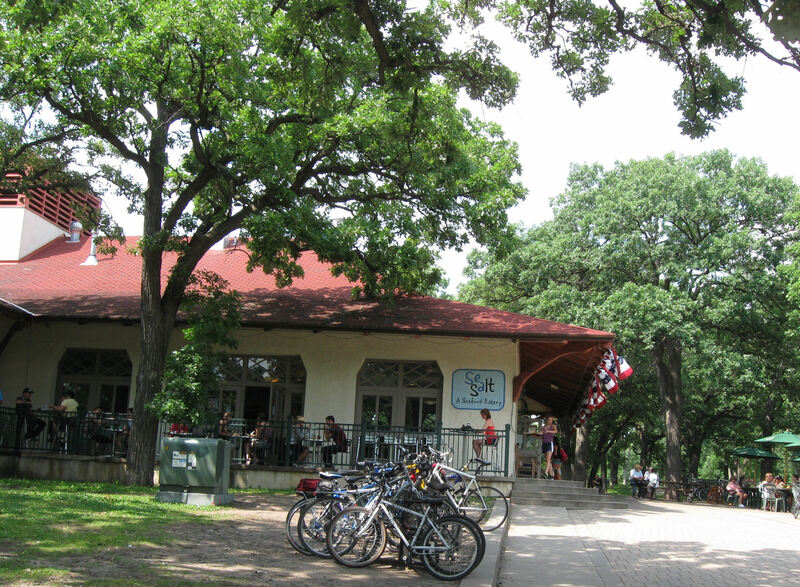 The park has a few structures to check out, including the Sea Salt Eatery, which we regrettably couldn’t pencil into our itinerary. My wife and I walked up and down the length of the creek for a couple blocks to see the details along the banks. Further down, the creek itself is calm except for a few water-speed-bumps. 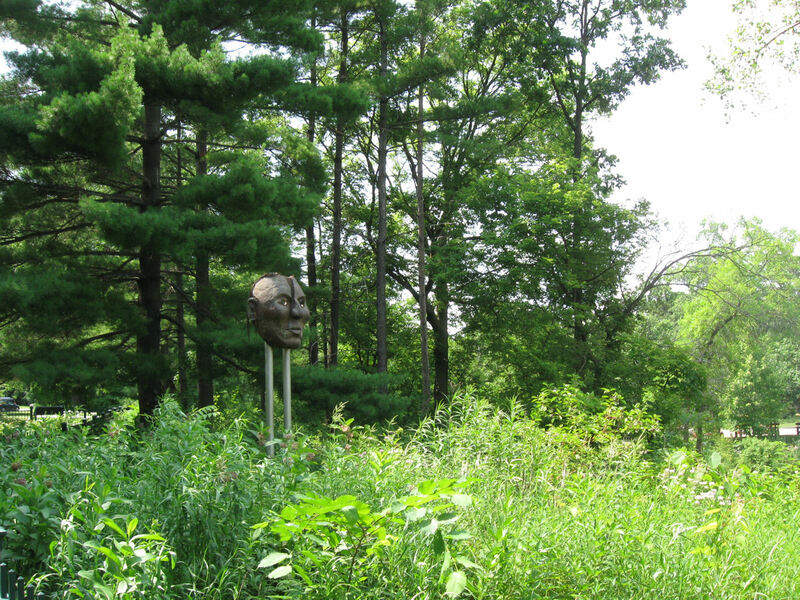 Standing nearby and high above is “The Chief Little Crow Mask”, Ed Archie Noisecat’s tribute to a local chief who died circa 1863. 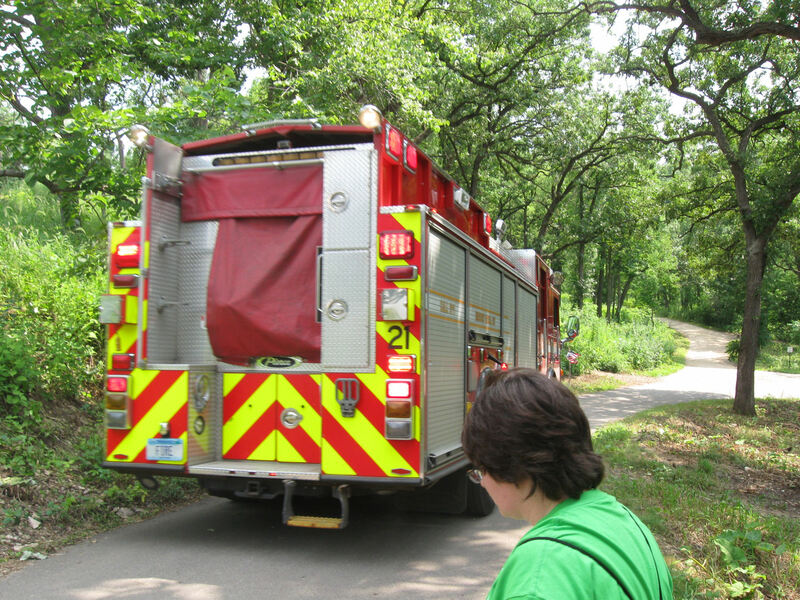 As a reminder we were still in the big city and not in a cozy rural getaway, at one point in our walk we had to leave the roadway and make room for an ambulance and fire truck heading east to a presumed emergency call. A shortcut’s a shortcut, I suppose. There’s an overlook above the Falls where you gaze upon the cascade and let the bubbly foam lull you into a natural stupor. It’s almost medicinal. In the distance, you can see the first bridge where visitors gather to watch the effects from afar. The view from the bridge is a bit obscured by the greenery on either side, but I wouldn’t call it dull. If you arrive at the right time, apparently the falls aren’t the only remarkable sight around. I have no backstory to go with this. In some situations, I just don’t like to pry. 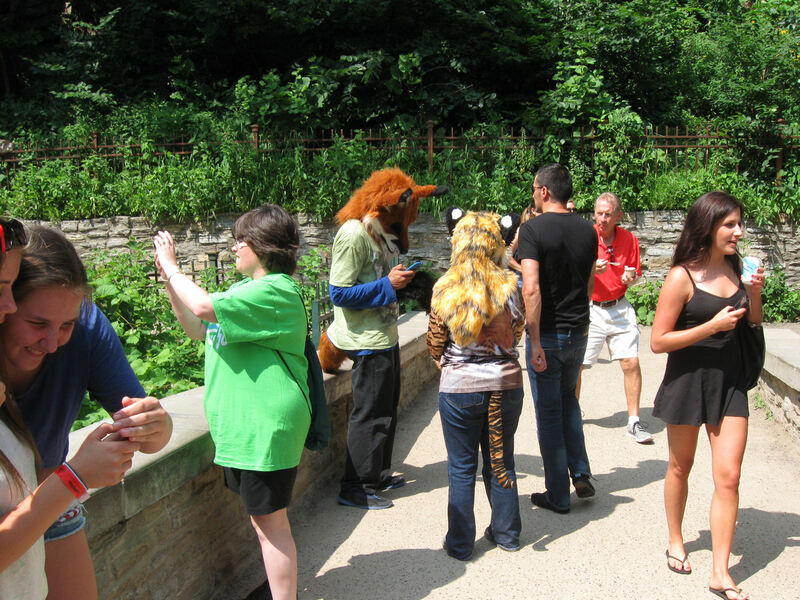 In our experience, the Twin Cities are a joint haven for diversity, where locals and visitors alike can convene and be themselves to their heart’s content, in whatever form or activity might result, even if it’s something I wouldn’t normally do. 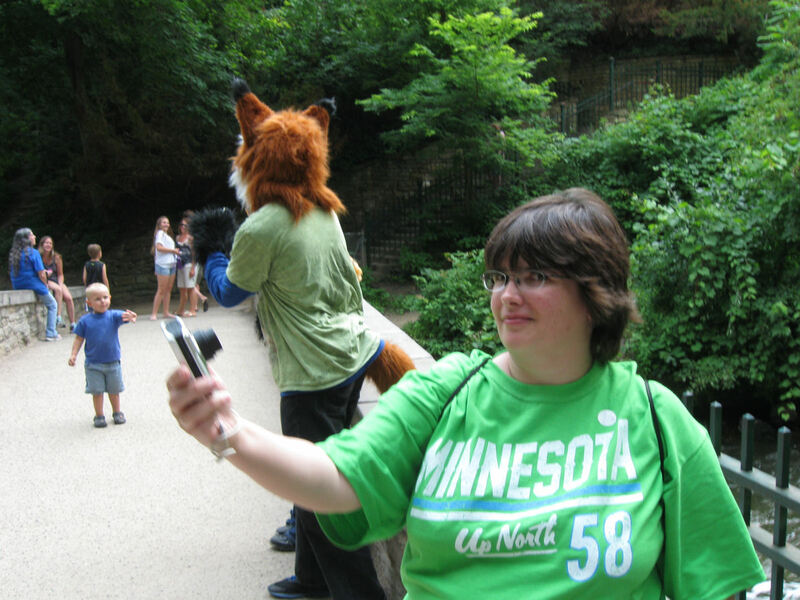 Far be it from me to stand in the way of people taking selfies. Or going furry in summertime. Besides, exceptions can be made for the right person at the right time. We were on vacation. I figured what the heck. 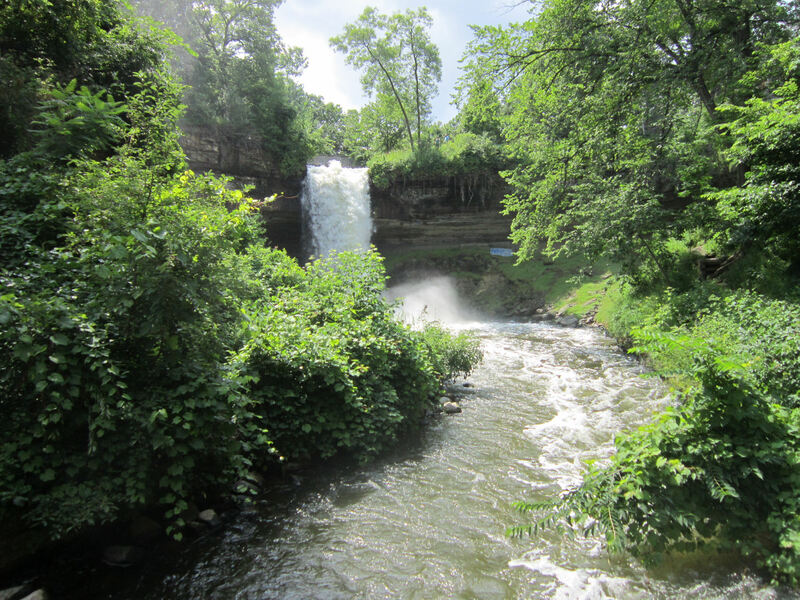 Credit where due: the title to this entry is a direct quote from Henry Wadsworth Longfellow’s 1855 epic poem The Song of Hiawatha, whose name-checking brought a bit of nationwide fame to Minnehaha. Granted, they’re still not as famous as Niagara or Frostbite Falls, but they’ve made their mark.